FOXBOROUGH, Mass. – On a set of muddy, undulating parking lots along the road to Providence, R.I., Robert Kraft saw an empire. Where an old stadium and a dilapidated race track and a mobile home park met the woods, a Boston businessman could imagine a gleaming new sports palace and a shopping center and people flocking day after day after day. This was 25 years ago and Kraft was about to make the first of three strategic moves that eventually landed him the New England Patriots. The purchase has propelled him to being perhaps the most influential owner in the NFL with a franchise that Forbes values as third best in the league, at $1.37 billion, while possessing three Super Bowl titles and a coach and quarterback widely considered to be the best in the sport. "I see the young players today coming from the parking lots to the practice field, they have no idea of this," the 69-year-old Kraft said one day just before the start of this season as he gazed out the window of his Gillette Stadium office toward the shopping plaza he ultimately built. "When I bought the team our players had to get into their unis and drive five miles, like Pop Warner, to a practice field that was part of a mental health grounds that the City of Foxborough leased to the Patriots." In 1985, the Patriots and their stadium were owned by a businessman and promoter named Billy Sullivan who was beginning to struggle financially. At that time, an option to buy the 300 acres of parking lots outside the stadium was offered by the group of businessmen who owned them. Kraft, who operated a packing-supply business and long harbored a desire to own the Patriots, saw his chance. If he could get control of the parking lots, then maybe he could find a way to control the stadium. And if he could be in charge of both the lots and the stadium, then maybe he could get the team, too. Kraft and a partner won the bid for the lots, paying $1 million a year rent for 10 years before buying them for $18 million. Today he figures the same land would cost about $40 million or $50 million. "In any business I'm in I'm trying to think ahead of where I was going," Kraft says. "I know some financial advisor thought I was nuts because we paid an option for the land that exceeded the revenue from football parking. "The cost of the right to maintain the option was a million a year," Kraft continues. "The costs of parking for football would never cover that. But that was the first step in a three-legged stool to try and own the team one day. So I know whoever would wind up owning the team would have to come to me at some point because they couldn't play games in the stadium because they didn't have the rights to the parking or if they wanted to put on concerts." Kraft didn't attempt to buy the team when it was sold in 1988 to Victor Kiam, the owner of Remington Products, in part because the stadium wasn't included in the deal. He could see the debt the Sullivan family was building up after Billy's son, Chuck, lost millions as a promoter on The Jacksons Victory Tour. The stadium fell into bankruptcy. When a bankruptcy court convened to sort out the sale, Kiam bid low, just below $20 million. Kraft bid $25 million. The difference was large enough for the judge to give the stadium to Kraft. "If [the bids] had been close the bankruptcy judge would have given the stadium to Kiam, but we got awarded the stadium," Kraft said. "So what did that mean? By then an unknown financial advisor told me 'You're crazy, that stadium is a white elephant.' If that team moves you're going to be stuck with a single-purpose stadium. But for me it meant I now controlled all the revenues of the team except for tickets. So all the signage, all the concessions, all the parking – whenever there was an event at the stadium I had all the revenue streams." More importantly, he had the stadium's operating covenant which was essentially a lease that said the Patriots had to stay in the stadium until 2001. This meant that Kiam, who had talked about moving the team elsewhere, or any other potential buyer had to come to Kraft. And soon enough, that's exactly what happened. As Kiam struggled financially, control of the team fell to one of his creditors, James Orthwein, in 1993. A St. Louis businessman, Orthwein was determined to move the team to Missouri. He put the team up for sale hoping Fran Murray – a man he partnered with to bring the team to St. Louis – would buy it. The sale was handled by Goldman Sachs and from the beginning, it seemed everyone had conspired to keep the Krafts from buying the team. Namely the Krafts weren't allowed to see any of the club's financial information unless they agreed to put a value on operating covenant. But pricing the covenant would make the team easier to sell, so Kraft simply said the covenant had no value. This infuriated the people who ran the sale and as a result Kraft was the one prospective buyer out of 15 who wasn't allowed into Goldman Sachs data room to study the Patriots' books. 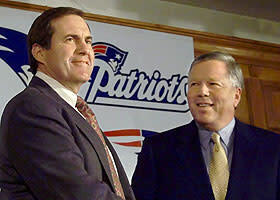 Kraft with Belichick during the coach's introductory news conference in January 2000. One morning Kraft met some Goldman Sachs executives for breakfast at the Pierre Hotel in New York. Jonathan Kraft, Robert's son and now the team's president, remembers the Goldman Sachs people demanding a value on the covenant. Eventually Robert Kraft threw down his napkin and said "I'm not putting a value on the lease, either you let me in the data room or not." Then he stormed out of the room, followed by Jonathan. The ploy worked; the Krafts got four hours in a data room. But unlike the spacious, comfortable suites with conference tables and a sprawling view of the Statue of Liberty like most Wall Street data rooms, the Krafts were set up in a small, windowless room that appeared to Jonathan Kraft to be a storage closet. They could only read the documents; no photocopies, no notes. And so Jonathan Kraft, two attorneys and a tax advisor sat on metal credenzas dictating key points over telephones to their office voice mails. "The right number to buy the team was 116 [million dollars] and I was willing to go to 125 million because it was clear they were going to move the team to St. Louis and we had injunctions ready to go. It would have been a mess. Anyway, we went to St. Louis [in January 1994] and I met with that Orthwein and we agreed to pay 172. It shows you the craziest thing I ever did. That price in 1994 was the highest price paid for any sports franchise in the world in any sport." Yet even after the deal was agreed upon and Kraft said he would pay far more than he thought the Patriots were worth, there came on the eve of the announcement one last attempt to get the Patriots and move them to St. Louis. Kraft remembers getting a call and being offered $75 million to get out of the stadium lease. Kraft put down the phone. "I can't believe they are trying to bribe us," he says he told Jonathan. Only his wife Myra thought it was a good idea. "You paid $25 million for an old stadium and you're going to get $75 million," he recalls her saying. "We can give more money to charity and you will get a new team, another team." She was right. It was a great offer. Still Kraft couldn't bring himself to do it. "I went back to the early '50s," he says. "My team was the Boston Braves. When I was a kid we never got to see Hank Aaron. This wasn't about money. Certain things in life are what you are passionate about. This was my chance to step up. I went way beyond what was appropriate but I knew I would never have another chance. And I had the confidence of sitting in those stands that there was tremendous brand equity in that region that could be tapped if we ran a respectable operation." 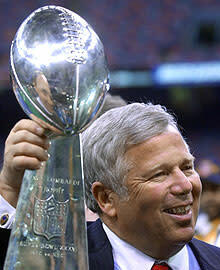 Kraft shows off the Lombardi Trophy after his team's first Super Bowl win in February 2002. In the end, that is what it became. He leveraged the threat of the team moving to another part of New England to get $70 million in infrastructure loans from the Massachusetts legislature and a low-interest loan from the NFL to build Gillette Stadium, which opened in 2002. The shopping center came five years later. Now it is a sprawling megaplex on the side of Route 1. "It struck us then [Robert and Jonathan] were the smartest people in the room," says Marc Ganis, a sports business consultant who was working with a rival bidding group that included Tom Clancy, Paul Newman, Tom Selleck and Walter Payton. "I was blown away and we had lost. I knew then from seeing how it worked, that we were seeing someone who would be a great owner in the NFL." Of course it has not come without dispute. Kraft infuriated Connecticut leaders in the late 1990s when he agreed to move the team to Hartford in exchange for a publicly-built stadium, then pulled out of the deal to stay in Foxborough. Many in the league also question the Patriots success after they were caught taping other team's signals in 2007 in a celebrated case that later came to be known as Spygate. Suspicions were further raised when the league office destroyed the tapes it confiscated from the Patriots, in a sense destroying the evidence – some allege to protect a powerful owner. But to imagine what Foxborough was and what it has become is remarkable. Especially in just 25 years. "I was always trying to figure out how I could buy the team," Kraft says. "For me life is about execution. If you want to make something happen you have to find a way to execute your wishes."